One of the most difficult things to remember when showing horses is that it is ultimately a game of comparisons, and while you have control over some things (how much effort you put in, how well you take care of your horse etc. ), you don’t have control over others (like when the World Champion shows up at the horse show, the weather, if your horse happens to be lame that day, if YOU happen to be lame that day). But even if everything goes perfectly, you need to always be aware of what could be called “The Power of -Er”. So I know you’re thinking “What on E(a)rth is she talking about? !” What I mean is this: when judges place horses at horse shows, they are always comparing one to another, and even if you do everything perfectly, there is always a chance that someone (or someone’s horse) is doing it better. Or bettER. 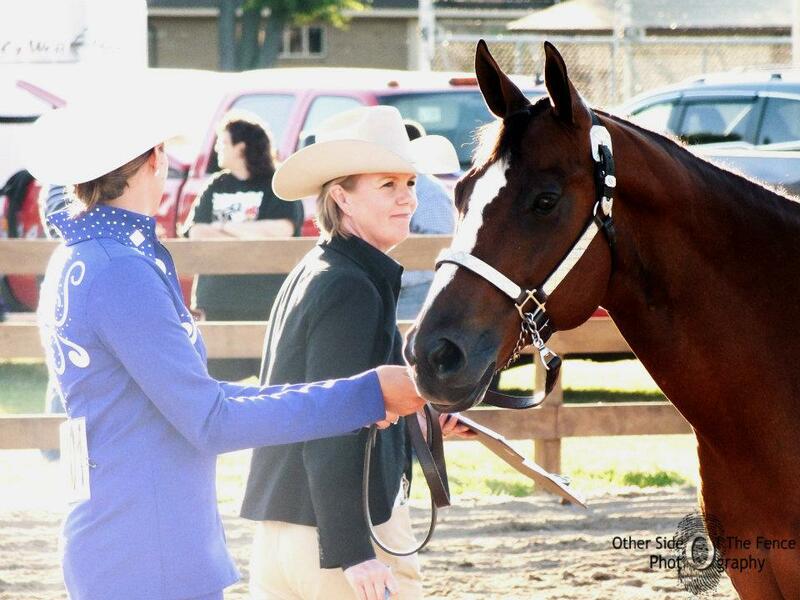 As an example, I occasionally get approached by exhibitors wanting to know how they can improve, and typically, depending on where we are in the horse show, I have no problem sharing (when they seem to be polite, and don’t argue). I am all about people doing the best they can to improve. The trouble comes when there is no realistic way it can be improved upon, or when it’s just a matter of someone else’s horse doing “it” better that day. That’s usually when judges get a bad rap (and typically that’s not fair). For example, in Western Pleasure (with stock type horses) I am looking for a horse that is demonstrating true gaits, flat through the knee, using it’s hock, and staying consistent throughout the class (and before anyone gets upset, that was in no particular order there). The winner is usually going to be the horse that is truER gaited, flattER through it’s knee, driving hardER through it’s hock, and more consistent than the horses placing below him. At all gaits. Both ways. Except when all are close in ability. (See Losing Doesn’t Mean You’re Bad (and Winning Doesn’t Mean You’re Good), for more on that situation). When making comparisons, we use the “Power of –Er”, and some horses when compared to others, are just flattER through the knee. It’s a matter of stride length, shoulder length and angle, and several other issues of equine anatomy. In short, how flat a horse is through it’s knee is ultimately pretty hard to change. Sometimes, how true gaited they are can also be hard to change, although how they are shown can influence that. The point is that sometimes, no matter how good you thought your ride was, it’s physically impossible for a horse to change enough to beat a particular horse that happened to show up that day, and for some people, that is a difficult pill to swallow. Similarly, in equitation classes, I like to see riders who are deepER in their heel, strongER through their leg and seat, and quietER with their hands. You may execute a pretty good pattern, but if you want to actually win the class, you also have to do all of these things, or at least do them bettER than everyone else in the class. Classes like equitation, horsemanship, and showmanship, are all classes judged on the rider, and typically things that the rider has much more control over. I really think that as people start to grasp this concept, they can also start to enjoy showing horses more…and this is also true for parents, grandparents, aunts, uncles, and cousins. Just because your rider does well, does not always mean that they did bettER than everyone else in the class at everything that was evaluated, and likewise you can’t let a judges placing dictate whether or not to be happy and proud of that rider (or yourself). This is why setting very specific performance goals (execute a perfect 360, a straight trot line, the correct diagonal), and making a big deal of it when these things happen, and subsequently taking the primary focus off of placing, can increase the fun factor considerably. If your rider takes the correct left diagonal when they typically struggle with it, it’s ice cream for everyone!!! (Or whatever). But you have to agree on this with them ahead of time…or they’ll just roll their eyes, and think you’re weird. Heck, they may do that anyway, but you’re getting ice cream, so who cares? Seriously, though, if you make this kind of non-placing based goal setting part of your regular routine, you’ll be amazed at how eventually, the placings you’re after will become a reality…and if they don’t, there’s always ice cream!